Well....despite the fact for the past three (I know totally unrealistic) Sundays I've wanted to show you my finished jumper........it remains unfinished.......again! So I've done the button bands on the left shoulder, I have another three inches of neck to do, and then just a short cuff on the sleeves........I will be finished by next week right? I'm still fairly nervous about the fit and decided against the waist-shaping that some ravellers have done, wanting it to go over other things.....I do hope I've not made a stripey tent though! I've just returned from a ruff and tumble party with littlest boy and the weather is just dreary and rainy. We ran our oil out at the beginning of the year to rehouse the tank, and with work being done on the house at the moment, it is still empty. It was such a lovely suprise to come home and find hubby had cleared the fireplace and lit a fire......no shivering under blankets tonight! As I was otherwise occupied with bouncy castles, I wasn't quick enough for prime position. Well....what with having my knit head on recently, I am totally behind with everyone......it will be rectified I promise.....but I must not have another half-baked jumper picture next week! I'm sure you will have it finished for next week! HOnestly what are we like, I usually have several things on the go too instead of finishing one off and then starting another. 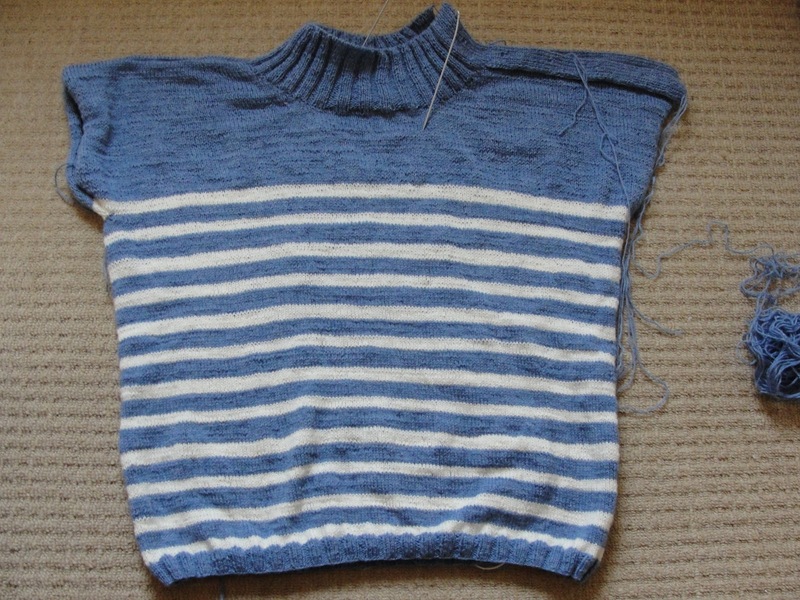 It is looking fantastic, and I think you will be happy with the waist shaping. Those jumpy parties are loud and exhausting, so nice to come home to that lovely calming fire. It is still hot here, I want cooler temps! I'm sure you'll have it done next week ... or the week after... definitely :P Looks really cute though! I like it a lot. That Jumper is going to be fab! I love a Stripey top, me. My fingers are firmly crossed for you that the sweater fits perfectly! Faith,I do love your jumper and i think I'm with you on not doing the waist shaping. I'm sure it look glorious after all the hours you have put into it. I frogged mine and now just need to be patient to start with the correct yarn and needles nest time. I have about 1,2,3,4...oh dear maybe 5 projects unfinished at the moment. Terrible that i started a crochet blankie this weekend. I truly get bored very quickly. That jumper is adorable! I'm sure you'll have it off the needles soon. Can't wait to see what blanket you have in mind! bouncy castles used to sound like fun, now they equal bruises! Nice hubby, smart dog! Oh just love the fire, its been cold wet and dreary here of late also and its so nice to get inside and snuggle up and what a warm and inviting surprise to get when you came home, I'd be after that prime spot as well lol. I love your jumper and am sure it will fit perfect but I can understand looking at a project that is so near done and seems to be taking forever and your mind does wander onto what your going to do next. I hope by next week it is complete. Such a warm coZY fire. The pull over is looking awesome. Your jumper is looking great! I´m sure you will have finished it soon! The striped sweater is lookin' great. I love the small stripes and your idea to do cuffs and a button band. I love how the garment will be warm enough but cool enough as well. I'm still impressed about anything garment related, so as far as I'm concerned, you've been doing a lot! Oh! It is almost done and it is beautiful!!!! You are a superb knitter! I so envy your warm and snuggly. We are so dry here. Very strange weather and very unFall-like. Ooooh I do love a stripey top! It looks amazing hon. I hope you've got the stripy top done, and it all fits now. 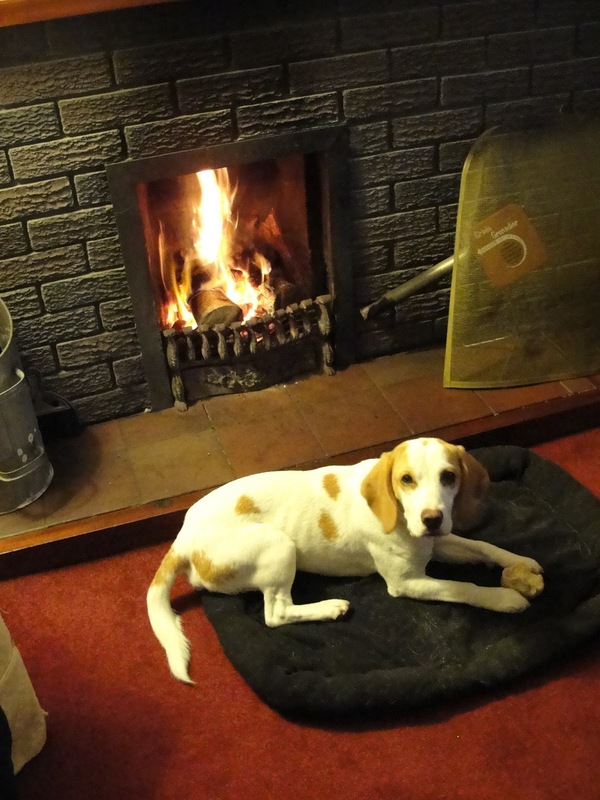 And I recognise that dog sitting as close to the fire as possible and blocking all the heat, happens all the time at my parents!